Three Hope men’s soccer players have received all-region recognition from the National Soccer Coaches Association of America (NSCAA). Seniors Jason Muller and Grant Neil both made the NSCAA Central Region First Team, while junior Tarwo Konbloa is on the Central Region Third Team. Muller and Neil both became two-time, all-region honorees. 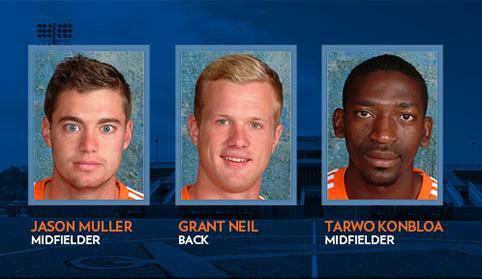 Neil was a second-team defender in 2012, while Muller was a third-team midfielder in 2012. Grant joins his brother, Logan, as a two-time, all-region player. Logan was a second-team goalkeeper in 2011 and 2010. Hope coach Steven Smith said it is exciting to see these young men rewarded for their hard work and their team-oriented play and leadership. Konbloa, Muller and Neil helped the Flying Dutchmen match the school records for wins in a single season with a 17-5-2 mark. Hope reached the second round of the NCAA Division III Tournament and won the Michigan Intercollegiate Athletic Association (MIAA) Tournament. All three were All-MIAA First Team Selections in 2013. Muller, a midfielder from Petoskey (Petoskey HS), led Hope with 16 goals and 36 points in 24 games. He also topped the Flying Dutchmen with 44 shots on goal. Neil, a back from Holland (West Ottawa HS), helped anchor a Hope defense that yielded on average only one goal per game this season. He also contributed offensively with a team-high 10 assists while chipping in two goals. Konbloa, a midfielder from Kentwood (East Kentwood HS), scored six goals to tie for second on the Flying Dutchmen. He also had six assists. Click here to see a list of Hope’s all-region selections. For the fifth consecutive year, ExxonMobil has provided support for high school students to learn about the natural and applied sciences as participants in the summer research program at Hope College. Hope football player Santino DiCesare has been given the Flying Dutchmen’s Allan C. Kinney Award, which has been presented annually since 1971 by the football coaching staff to a senior player for maximum contribution to the football program.